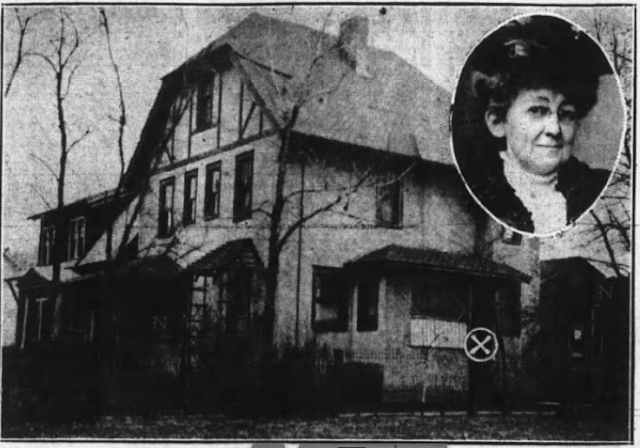 In April of 1898, Mrs. Margaret Wyatt of Tamaqua passed away. A quiet, unremarkable woman with a quiet, unremarkable life, Mrs. Wyatt was prepared for burial without much fanfare. She was to be interred at the Odd Fellows Cemetery and the necessary preparations were made by Joseph Southem, the graveyard sexton. 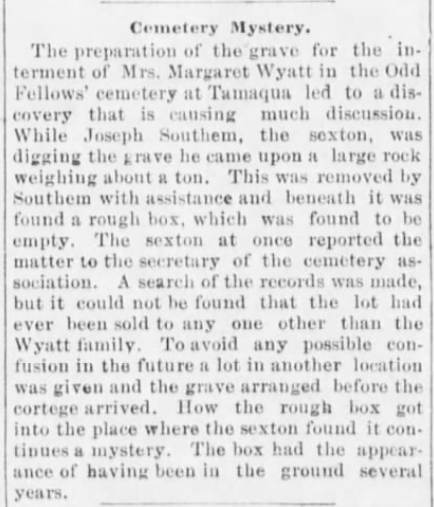 However, as Mrs. Wyatt's grave was being dug, Mr. Southem made a curious discovery, leading to a mystery that has remained unsolved for over a century. Why on earth would anyone bury an empty box in a cemetery beneath a one ton boulder? Who would go through such trouble? Did the box once hold a valuable treasure that had somehow been unearthed before 1898? Or was somebody planning on returning to the spot later with the hopes of burying something that nobody would ever be able to find? That, of course, is the mystery, and it's a mystery that boggles the mind the more you stop to think about it. The story provides some possible clues as to the age of the mystery box; according to the sexton, the box appeared to have been in the ground several years before it was unearthed. Could the box have been buried before the cemetery was laid out? 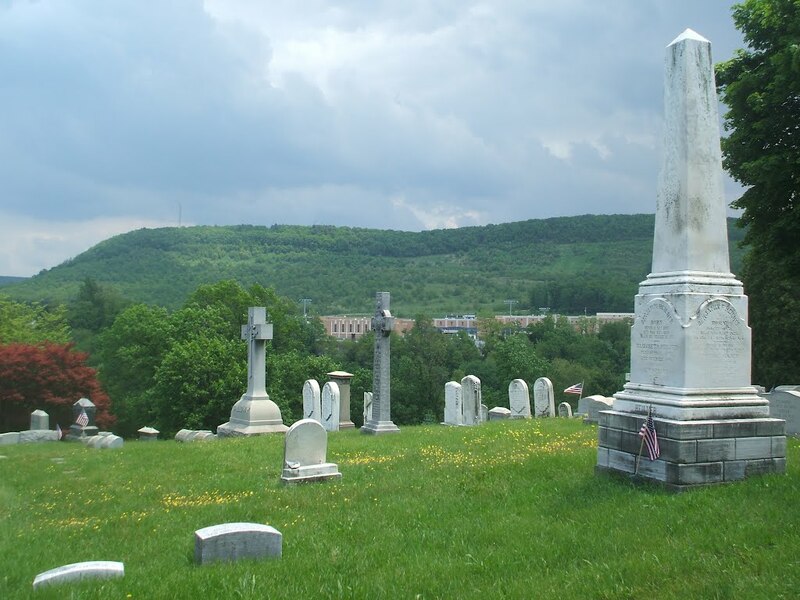 According to W.W. Munsell & Co.'s 1881 History of Schuylkill County, the Odd Fellows Cemetery in Tamaqua was opened in 1865, on a plot of thirty acres at the head of Broad Street. The cemetery grounds were purchased by the Harmony Lodge on January 4, 1864. It also appears that the same plot of land was once the site of one of Tamaqua's first churches, the Primitive Methodist Church. In 1830, a coal mine operator named William Donaldson opened his house for religious worship and he, being a preacher, conducted the services. With a hundred and fifty or so citizens, Tamaqua was just a tiny village back then (it would be two more years before the borough was incorporated), and the site of the old church was on the parcel of property that Odd Fellows Cemetery would later occupy. Interestingly, the north side of Odd Fellows Cemetery contains a mass grave of more than 100 unknowns. These remains, from the unclaimed bodies from the old Primitive Methodist Church, were placed into a large box and buried by the new property owners. If the mystery box discovered in 1898 is from the same general era, this would date the box sometime between 1830 and 1865-- the time between the opening of William Donaldson's church and the first burial at Odd Fellows. This raises some fascinating possibilities. Perhaps the box unearthed by sexton Joseph Southem once held the remains of an early parishioner of the old Primitive Methodist Church. The box would have been in the ground for 68 years by the time it was found-- but why then was it empty? Could the human remains inside the box have disintegrated into dust in less than 70 years, thereby making the old box appear empty? It's possible, but if so, surely some scrap of clothing would remain. Unless, of course, the box was used to bury a newborn child. 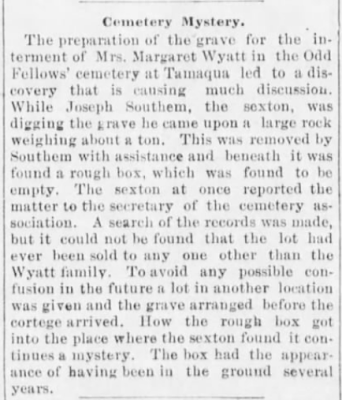 While the the newspaper article from 1898 fails to say how large the box was, it was probably not large enough to be mistaken as a coffin. Or maybe the old Primitive Methodist Church, while interring its own dead back in the 1830s and 1840s, came across an even earlier burial ground, and decided to bury those even older unknown remains in a mass grave, like the one that currently exists on the north side of Odd Fellows Cemetery. 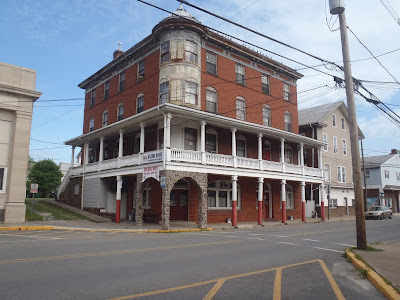 It's possible, as history tells us that Tamaqua was settled as early as 1799. It's safe to assume that human remains buried in 1799 would probably be reduced to dust after a century, and the mystery box was dug up in 1898, or 99 years after the first settler arrived. Perhaps the only person who could answer this question is William Donaldson-- and he's not talking.